On Sunday, we had a big family dinner, a "last meal," if you will for DS who is returning to Tulane soon to finish (and that's the operative word here) his senior year of college. As is tradition in our family, DS chose the menu: a mixed grill of fresh tuna, rib steak, chicken and zucchini. But he didn't want any dessert. In my mind, no meal is complete without a sweet ending, so I asked Josh, DD's sugar-loving boyfriend and, before I could even finish the question, he responded: Peanut butter cookies. The batter right before the egg and peanut butter were blended in. 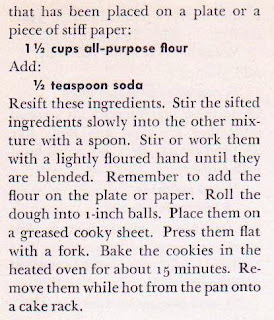 I chose a recipe from my go-to children's cookbook, the c.1946 Cookbook for Girls and Boys by Irma S. Rombauer, who wrote the Joy of Cooking for us grownups. 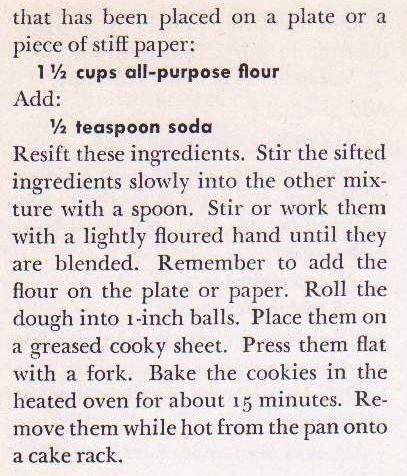 A hand-written recipe in my collection for another version of peanut butter cookies, Peanut Blossoms, instructed the placing of a Hershey's Kiss at the center of each cookie right after it came out of the oven. I did that on some cookies, put Peanut M&M's atop others and the remaining ones I baked in the traditional manner, with fork lines criss-crossing the top. Everyone loved these cookies, even DS who didn't want dessert in the first place. Not being a fan of peanut butter cookies, I can't really comment. They tasted a bit sandy to me, a texture I adore in the French sable, but didn't in this cookie. 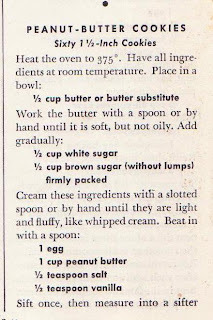 I used "natural" peanut butter here -- the only ingredients were peanuts and salt -- because I figured that's what was likely used when the recipe was written in the 1940s. But a little research (the reliable internet kind, so take it with a grain of salt, or sugar) reveals that the first shelf-stable peanut butter (where the oil doesn't separate from the peanuts) was introduced in the 1920s. 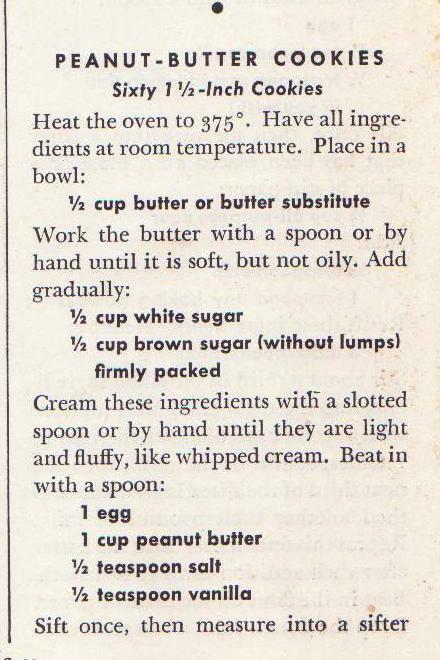 And it wasn't until the 1930s that peanut butter was listed as a cookie ingredient. I just found your wonderful blog and I'm going to follow along. I also live in Brooklyn and I love to bake. It will be fun to try some heirloom recipes. Hi, Pat. Glad you found me and I just checked out your wonderful blog. I hope you'll participate in the first annual Brooklyn Bake-Off, to be held sometime in October at my house. really, susan? i'd love to be in the bake-off! Peggy: Of course you can enter. And it's so convenient for you!